Making chai-flavored drinks for your restaurant or coffee shop is quick and easy with this DaVinci Gourmet sugar free chai tea concentrate! This flavorful concentrate contains caffeine and features a sweet and spicy combination of flavors. It is made with black tea concentrate and natural chai flavors including cinnamon and cardamom. Significantly reduce prep time and enhance your drink menu with popular drinks with this sugar free chai tea concentrate! To make a chai iced tea, simply mix this concentrate with water and pour over ice. It's that easy! You can also blend this concentrate with steamed milk to create chai lattes. Sweetened with sugar free, no-calorie Splenda Brand Sweetener, this sugar free blend of chai tea concentrate is sure to be a treat for your health-conscious patrons! Splenda tastes like sugar, giving you great flavor without the calories. 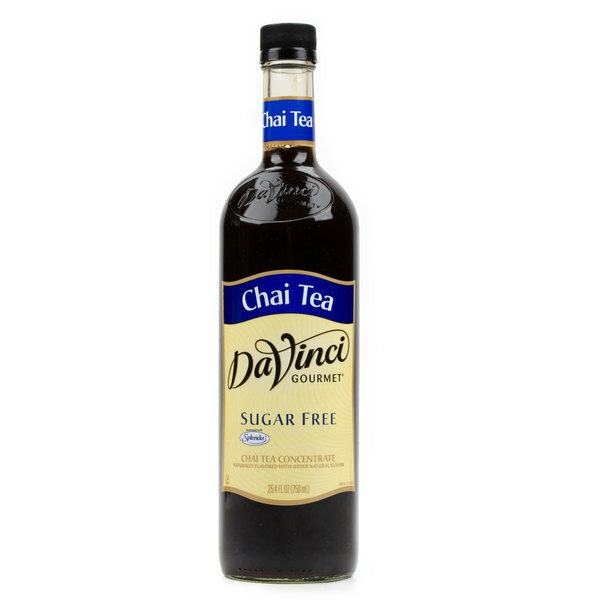 Sold in gourmet coffee shops, specialty food stores, food service outlets, and grocery stores, DaVinci Gourmet products, like this sugar free chai tea concentrate, have a long history of commitment to quality and superior taste. Excellent flavor and price! It is so hard to find a good sugar free chai concentrate at a good price. This beats coffee shop teas and allows me to use as much or as little as I'd like. I like adding to milk, water, or even baked goods for a unique flavor. Highly recommend. I am so happy that DaVinci came out with a sugar free option. I'm not looking to completely cut sugar out but now I can add as much as I like and In my book that is perfection. Great Job! This is chai taste you want without the sugar. It has a strong chai taste with out too much of a sugar free after taste. With the DaVinci sugar free Chai Tea Concentrate, it makes my cranberry teas have a christmassy taste and a WONDERFUL cinnamony smell. Using the Chai Tea Concentrate helps me start my day! My goodness! Put some milk on it, and you are ready for the day. I love it because it is super easy to prepare a great - and sugar-free - chai latte. It is hard to tell that it is sugar-free, what makes it even better. One of my favorite products here. We have a lot of customers that want sugar free options, and the sugar free chai is especially popular! The flavor is still delicious and rich- you would never know it was sugar free. The sugar free chai tea concentrate is great and very delicious. The taste is superior to all other brand and its a great sugar free option. 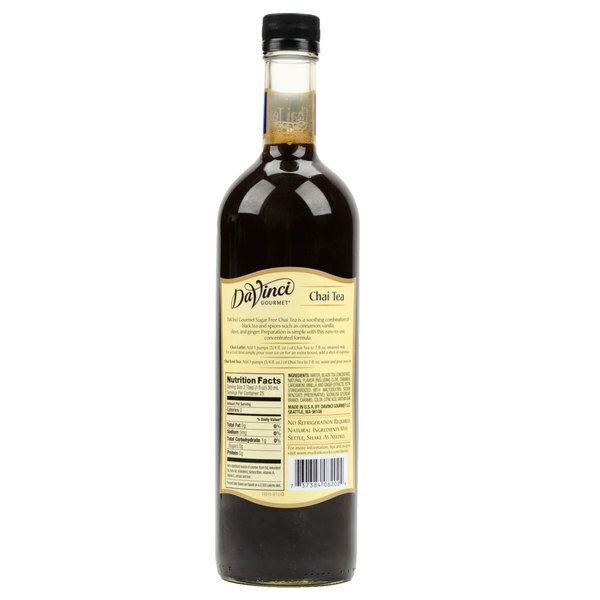 The DaVinci Gourmet Sugar Free Chai Tea Concentrate is a great addition to any Chai Tea Latte. It doesn't taste like it is sugar free and my customers love it. This Chai tea concentrate is delicious! I have also purchased the version made with sugar and I can hardly tell the difference! I use 2 ounces plus an ounce of heavy cream to make a 12 ounce cup of hot tea and it is the best I have had anywhere! I use this syrup on my low carb diet. It is absolutely the best! Interesting at best, I'm not sure what it is but it seems this flavor has a bitter aftertaste not normally associated with the "chai" flavor. Might take a while to churn through this bottle. I use this to add flavor to my protein shakes. I add to vanilla protein shake (made with skim milk) along with a tablespoon of instant decaf coffee and then blend with ice. Tastes like an iced Chai tea latte without the added calories and I am still getting 30 grams of protein. I have several friends using for the same thing and love it. Taste was a but off. Little too artificially sweet for my liking. Can't say I would buy this again because of it's flavor. I guess it's sugar free so thats good.